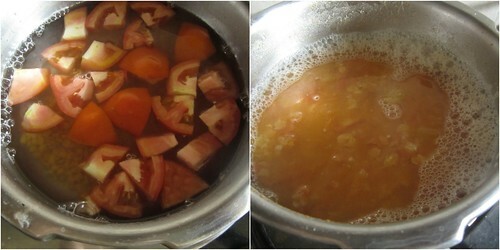 For a long time I was indifferent to Rasam.I didn't understand what the fuss was about a water-like gravy with tomatoes and coriander leaves.To top it,whenever I tried making it,it didn't come out all that good.I mean,Rasam was supposed to be a very easy side dish,is it not?Now how hard can that be? Apparently,Rasam is not a simple gravy spiced up with podis and tomatoes.To make a water-like gravy taste good there has to be a good balance of ingredients.I've tried many recipes for making rasam but this one comes close to what amma always made when there was a dearth of vegetables.One tomato,a handful of dal and coriander leaves and a tsp or so of Rasam powder,she even added sambhar powder sometimes,and a simple tadka of mustard and curry leaves and there it was-simple,quick and delicious! I've tried to maker her version instant by cooking the dal and tomatoes in a pressure cooker,a method frowned upon by many but works like a charm. In a pressure cooker add the dal and tomatoes(keep 1/4 of a tomato aside for seasoning) and cook for 4-5 whistles or till the dal is mushy and the tomatoes are cooked to a pulp.Using a potato masher or a spoon,mash and mix the dal-tomato together. 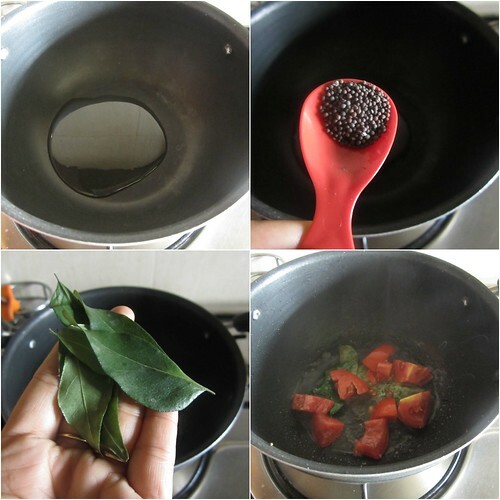 In a kadai add oil,splutter mustard seeds and add curry leaves.Mix in the reserved tomato and give a good mix. 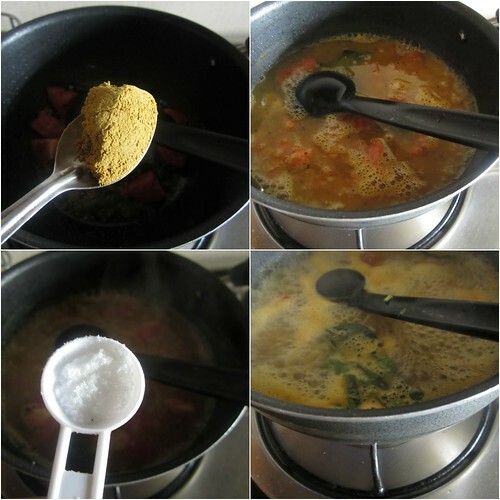 Add rasam powder and saute for a minute.Pour the dal-tomato mixture into the kadai,add salt to taste and let it come to a boil. Add coriander leaves and simmer for 3-5 minutes.Switch off the flame,add some more coriander leaves and serve with rice and urulai roast. Very nice.. sounds yummy ..
its not a side dish divya :) for many its a main dish ! well go with potato as u said ! It has to be prepared in a separate vessel (i.e lead vessel) nothing can beat ! 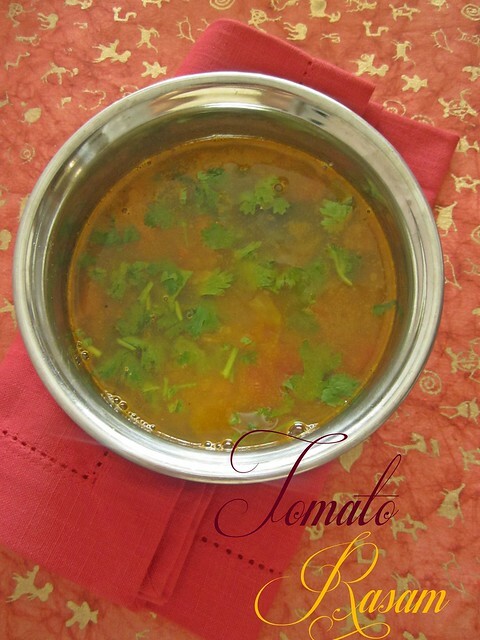 Very refreshing and yummy tomato rasam. Interesting version, would surely try soon. 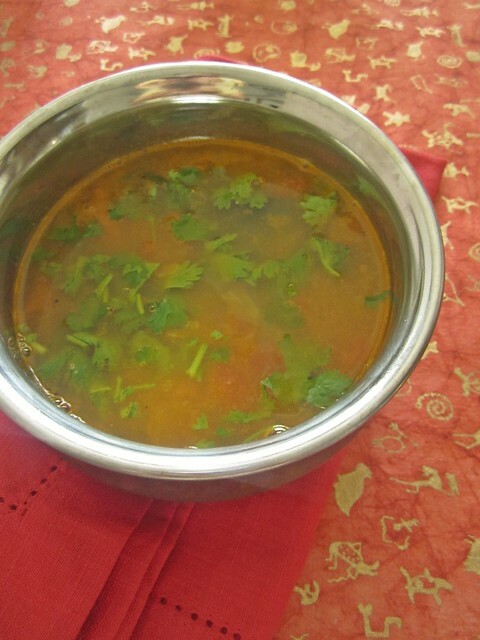 My all time favourite rasam, can survive for many days with it.